Finally, after a long day's travelling, we arrived in Real de Catorce. Or rather on the other side of the Ogarrio tunnel from Real de Catorce. We had to wait for a bus to take us through the tunnel, which was long, lacking in oxygen and one of the bumpiest rides of my life! Real de Catorce is about 3000m above sea level so in December, even in Mexico, it was cold. This meant wrapping up warm to have our evening stroll. It's areally pretty town - my photos don't do it justice. Ther's a mixture of tacky tourist shops and really interesting individual stalls and shops. We had dinner in an italian restaurant (Real is full of them all competeing against each other!) and then went back to the hotel and almost killed ourselves with the wood burning stove. The ventilation switch was difficult to get to stay in the right position and we started to notice the room filling with smoke... but we survived and managed to sort it out so we just had a warm eveing instead of a suffocating one! The next day we went horse riding. 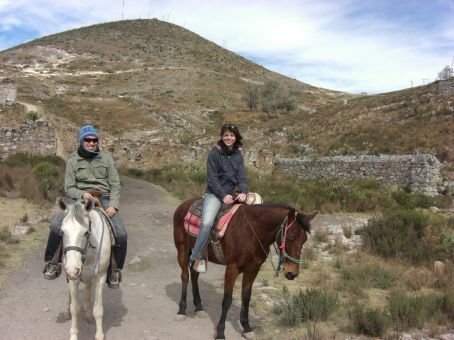 In the square local cowboys rent out horses and take you on guided tours to places around Real de catorce. We decided to go to Pueblo Fantasmo higher up in the mountains above the modern town. We rode up on two beautiful horses and with our cowboy guide. The views were stunning and unforgettable and when we finally got to the top we explored the ghost town and the entrances to disused silver mines, took hundreds of photos and then began the slightly slippery trip back down. We spent the rest of the day walking about and buying souvenirs before returning to the other side of the tunnel to catch the last bus back to Matehuala. We decided to walk though the tunnel cos there wasn't a bus for ages, but got picked up and had a ride in the back of a pick-up truck which made things quicker. However, once on the other side there was nothing to do but wait for 2 hours until the bus was ready to leave. (it was itting there but the driver didn't let us on til about 20 mins before it was due to go). We walked about but there wasn't much to see and the su was setting so it was getting cold... We grabbed some hot drinks in a little shack/cafe and then went outside to wait in a closed down shack until we were allowed on the bus. Real de Catorce was great, and one of the highlights of my time here in Mexico so far.